What do we do for the Esperanto community? 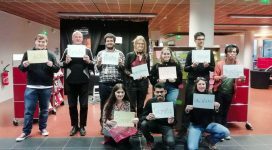 What do we do outside the world of Esperanto? How many people work for TEJO? How to work professionnaly for TEJO? What can TEJO do for you? The Global Esperanto Youth Organization (TEJO) is an organization of young Esperanto speakers with individual members and country departments in more than 40 countries, except specialized section. 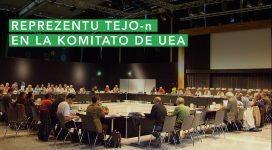 TEJO itself is the youth section of the Universal Esperanto Association (UEA). Its headquarters are located in Rotterdam, the Netherlands. TEJO (in fact, then World Youth Organization, TJO: Tutmonda Junular-Organizo) was founded in 1938 during the 1st International Youth Meeting (IJK: Internacia Junulara Kongreso), later the International Youth Congress), on the initiative of two Dutch teachers, Elisabeth van Veenendaal and her husband, with the purose of vulgarizing Esperanto , organizing international meetings and work about Esperanto in schools. Until the beginning of the 50s TEJO was transformed into a fully youth association and in 1952 it changed its name to today’s form – Global Esperanto Youth Organization (TEJO: Tutmonda Esperantista Junulara Organizo). TEJO is an organization that acts world widely, whose roots are the world’s sections throughout the world – over 40! orientation, handicap, religion, politics, social origin and language. TEJO is independent of any party. TEJO is neutral about issues unrelated to its objectives. To get started and to get more information you can go to the page: Become a member. If you are over 35 – become a patron! 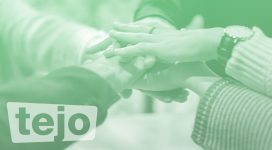 Paying a triple from your country basic contribution (MJ-Kotizo), you do not only support the Esperanto youth, but you also enjoy a close participation in the youth movement. 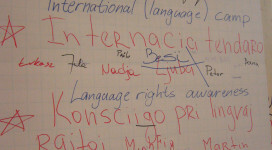 And the most important: you help Esperanto’s youth movement! Finally, if you are a country or a special youth organization, read the page How to become a country section?. We organize an International Youth Congress, annually in different countries of the world. Other events organized by TEJO include seminars and trainings in various topics. TEJO publishes the social and culture magazine “Kontakto” and online newsletter “TEJO Aktuale” . We are also active in social media such as Facebook and Twitter. We also support and look accompany our country sections, and also encourage the creation of additional youth sections where there is no longer. Among the most well-known TEJO projects is “Pasporta Servo” – a social network that integrates people who offer free hosting in their homes and those who would like to use this possibility. The organization defends the cultural richness of linguistic diversity, human rights and in particular their linguistic and global understanding through easy access to international contacts. TEJO often participates international youth conferences, such as Yo! Fest (a meeting of European youth activists, organized by the Youth Forum of Europe) and ECOSOC (an economic and social forum of the United Nations). We take TEJO’s ideas and values, advocating them, such as linguistic justice, human rights, equality, respect for cultural diversity throughout the world, support for minority languages, etc. As we are global, join talent and support the motto “from local to global” (Elloke tutmonden), in TEJO work the leaders of the various commissions, representatives of country departments, representatives of special department, paid workers and some others. In our website you can find the profile of many young people who have a role. We think that there is no need to having a formal post to work in TEJO, and for example, you can propose yourself to do activities in the name of TEJO and join in commissions. How to work professionally TEJO? Sometimes we publish call for tenders to engage people with knowledge, aptitudes and experiences strategically interesting for the organization. Follow our news channels! Help create a country or special youth organization. Establish training so that you become even more effective activists. Support a country proposal to host the International Youth Congress. If you want to help us somehow, you can do so when you join, participate in a commission, inform about your activities, exchange successful performances, donation, or other ways. You are welcome to contact us and tell how you could help or what you can do.